We supply a wide range of haberdashery products such as sewing accessories, Gütermann threads, ribbons, zips, Velcro, bias bindings and knitting needles and much more. We stock a full range of Dylon Fabric Hand Dyes and Dylon Fabric Machine Dyes. We also have a small range of Punch Shoe Care products which includes shoe laces, shoe brushes, insoles, heel grips, shoe shine and shoe polish. Please note that If we do not stock the item you are looking for then ask in store and we will try our best to order it for you. We look forward to hearing from you. 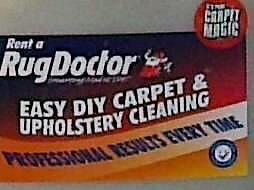 To rent the Rug Doctor you must provide TWO forms of identification, they are: a recent household bill OR bank OR credit card statement AND a UK driving licence OR credit card OR passport.